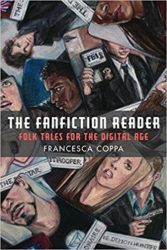 The Fanfiction Reader is the first anthology of fanfiction ever published. Short stories that draw on franchises such as Star Trek, Star Wars, Doctor Who, James Bond, and others are accompanied by short contextual and analytical essays which treat fanfiction—a genre primarily written by women and minorities—as a rich literary tradition that has important continuities with the communal tale-telling cultures of the past as well as the remix cultures of the present. Order from Amazon or get a desk copy from the University of Michigan website! Pair with The Fan Fiction Studies Reader (ed. Hellekson and Busse, 2014) for the perfect course!